Your Input: Canadian Poverty Consultation for Ontario Until October 2013. Hugh Mackenzie provides the interactive infographic CEO vs Average Pay in Canada: All in a Day’s Work? “Young people used to make up the bulk of minimum wage workers, but the data show that by 2011, nearly 40 per cent were 25 or older. Various social groups, unions and health-care professionals have been pressuring governments to raise the minimum wage to $14 an hour, noting it would mean a pre-tax difference of $650 a month to thousands of the lowest-paid workers in Ontario. The Workers Action Centre in Toronto, one of the groups fighting for a $14 minimum wage, is pleased to see increases tied to inflation, but warns it’s not enough. 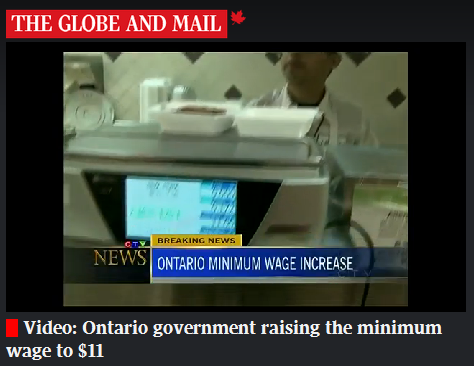 It is announced today that Ontario is increasing the minimum wage from $10.25 to $11 per hour on June 1, 2014. This new rate reflects the rise in the Consumer Price Index (CPI) since the last minimum wage increase in 2010. Consumer Price Index is a key indicator of how the economy is doing. January 30, 2014 10:15 a.m. The government will also introduce legislation that would tie future minimum wage increases to the CPI. This will ensure the minimum wage keeps up with the cost of living, and that increases are predictable for businesses and families. Under the proposed legislation, increases would be announced by April 1 and come into effect on Oct. 1. The proposed legislation would act on the recommendations of Ontario’s Minimum Wage Advisory Panel, which included business, labour, youth and anti-poverty representatives. Ensuring the minimum wage is fair and predictable for both workers and business is part of the Ontario government’s economic plan to invest in people, build modern infrastructure and support a dynamic and innovative business climate. The 75 cent increase reflects the annual change in Ontario’s Consumer Price Index (CPI) since the last increase on March 31, 2010. Increasing the minimum wage supports Ontario’s Poverty Reduction Strategy. In the first three years of the strategy, approximately 47,000 children and their families were lifted out of poverty.